CiF Watch, a CAMERA affiliate, has prompted a correction in a Guardian story by Harriet Sherwood which egregiously downplayed the crimes of a Palestinian prisoner. 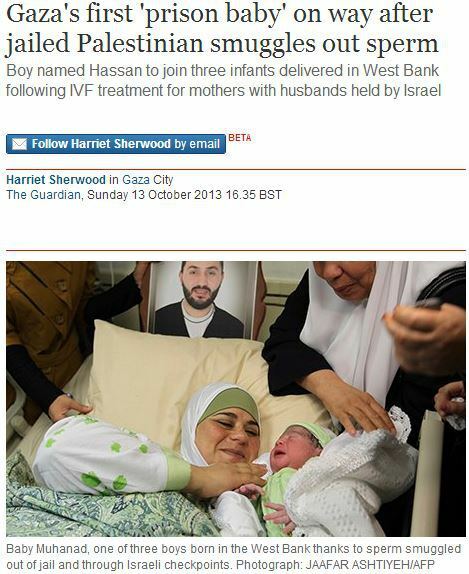 The Oct. 13 article, about a Gaza woman who reportedly became impregnated by her husband’s sperm which had been smuggled out from a jail in Israel, claimed that Tamer Za’anin had been imprisoned “for membership of the militant organisation Islamic Jihad” (“Gaza’s first ‘prison baby’ on way after jailed Palestinian smuggles out sperm”). CiF Watch provided the Guardian with Israeli court records showing that Za’anin not only belonged to Islamic Jihad, but also volunteered for their military wing (Al-Quds Brigades), responsible for deadly suicide bombings. Moreover, Za’anin pled guilty to four counts of being an accessory to attempted murder. Error (Guardian, Harriet Sherwood, 10/13/13): [Tamer] Za’anin, who had been denied permission by Israel to visit her husband in prison since his conviction for membership of the militant organisation Islamic Jihad just a few months after their marriage, consulted [the fertility doctor] by phone. Correction (10/15/13): Za’anin, who had been denied permission by Israel to visit her husband in prison since his conviction on four counts of aiding in attempted murder and for membership of the militant organisation Islamic Jihad just a few months after their marriage, consulted him by phone. CiF Watch and CAMERA commend The Guardian for the prompt correction. Other media outlets which, following communication from CAMERA, previously corrected reports downplaying the crimes of specific Palestinian prisoners include the Associated Press, The New York Times, and National Public Radio.